A couple of weeks back BoingBoing linked an article about how brain damage can render one unable to detect sarcasm. I made notes to tell my brother, the artist, because according to MRIs the sarcasm processing area of the brain is one previously identified as a subtle part of visual processing. I took this to show how we connect synaptically and also the consequences of small misfires. He paints the world as he/we see it but often throws in elements that are visually correct but just *wrong* — zebras looking over their shoulders for predators except they're on the moon, a waning Earth in the night sky above them. You might be able to use some kind of MRI mapping to find some cultural identifiers, separate the "they" from the "we". I'd think English exercises certain areas that Chinese doesn't get to, atrophies others. I was never able to pick up the French subjunctive from teachers and books while studying French. May have gotten it in a total French environment, we'll never know. 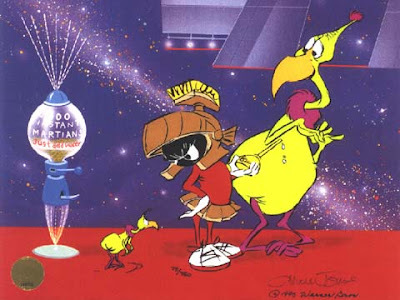 One a different note, I just had to change the link to the Marvin the Martian image file. Some people put in all sorts of traps for hotlinking to images. I try to give credit when I can, and clicking on the images should send you to the original image, but when people do that, it makes it nearly impossible. So I just download the image and paste it up onto the blog. If it were something that were uncommon (as many of the Women and Snakes images are) I'd have put in more identifiers. But Chuck Jones and company don't need any more publicity from me, and the folks who are too clever by half are too clever by half, a phrase that can only be understood by the sarcasm unimpaired. A couple of years back Internet Movie Database (IMDb) would accept hotlinks from my development machine at a static IP, throw 'em back when I ran the same app on a public server. AFIK you're operating under common web practice — if they ban hot links they're asking you to use your bandwidth, ie download the image and link it on your server. Well, good. That's a load off my mind. I have no problem with using Google's bandwidth. FreedomPop is UK's #1 COMPLETELY FREE mobile communications provider. With voice, SMS & data plans priced at £0.00/month.